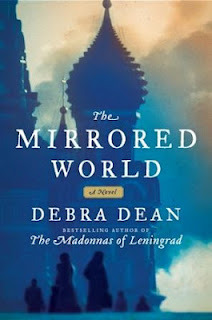 The Mirrored World imagines the world and life of St. Xenia, a historical figure known for serving the impoverished in St. Petersburg, Russia during the eighteenth century and endeavors to explain how she became the historical figure that she is known for today. The tale is told by Xenia's cousin Dasha and is enriched by historical details (and gossip) about the royal family and the quirky antics of the court during this time period. This is a sad interesting tale that I enjoyed quite a bit. It didn't have me tearing through the pages, but every time I opened this little book I found myself losing track of time as I became completely engrossed in the story. Dasha isn't the most interesting character but somehow the story is more interesting told from her point of view. The beauty of this book is the writing and how Ms. Dean manages to unveil a sad story in such an artistic manner. It's almost like a song, sad and poignant. My only complaint involves the description on the book cover. It tells the entire story. I like reading descriptions but this one goes too far. I'm not sure if it is for everyone, but if you enjoy historical fiction and great writing, give this one a try. Be prepared for a sad sad read though. It sounds really good until the sad, sad part. I haven't been able to read a sad book since 'Sarah's Key.' That one just about killed me and I'm still not ready to dive back into a sad read. I'm glad you liked it though! This one is sad throughout but there is some distance from the sadness though. That somehow makes it better. I love that feeling of getting lost in a book like you did with this one! I know nothing about St. Xeina, so this sounds interesting from a fictional POV. I like that her story is told through an outside observer's eyes...I wonder what the difference would be if told from her POV. Doesn't sound like something I'd normally pick up, but you make it sounds interesting enough. Telling from her point of view would have taken a lot of the mystery out of it. I think it had to be taken from an outside POV. Sounds like a pretty unique tale. I had never heard of St. Xenia but your review made me want to look it up! I hadn't until I read the book. It made it more interesting to me. I love interesting stories, but not if they're sad. I think it's one of the instances where the journey is more important than the outcome. I admit I became more interested when I read about the "unlikely transformation of a young girl, a child of privilege, into a saint beloved by the poor." Thanks for stopping by :). I'll be sure to check it out.